The primary conclusion of The Paula Principle is that women’s competences stand a chance of being fully recognised only if men’s work and career patterns change to a more ‘mosaic’ model. Central to this is the need for us to recognise that careers, at whatever level, should not require people to work full time or continuously (hence the mosaic image of different pieces put together in a variety of patterns, rather than a vertical career ladder). b. analysis from Sweden of how we should deal with climate change includes reduction of working time as a significant component. 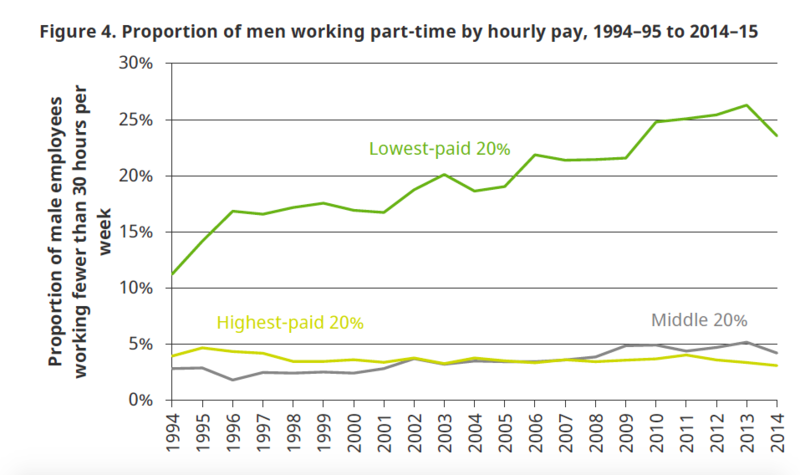 The IFS study shows that weekly pay for men has become more unequal over the past 15 years. A prime factor in this is that lower-wage (and presumably lower-educated) men have been working fewer hours per week, unlike their better-paid and better-educated fellows. 24% of the lower-paid now work less than full time, up from 11% in 1994; whereas the proportion of middle- and higher-paid men who do so has stayed more or less the same at under 5% (see chart below). This, combined with their relatively slow wage growth, has increased the gap between the low-paid and the rest. One natural response is to increase the pay rates of the low-paid. But an alternative – or rather complementary – measure would be to look for measures which would encourage higher-paid men to work less. They could take their productivity gains in reduced hours rather than increased income. Such an approach is gaining ground, as evidence mounts that people who work shorter hours are more effective when they are working. In some occupations this means that productivity gains compensate – maybe more than compensate – for the shorter hours. If you produce more car components or legal documentation per hour, then you can work fewer hours without any reduction in output. But it may be true also in occupations such as caring, where the service still needs to be provided for the same number of hours – it’s just done better. Older people in need of care can’t be fed faster, but they will get better care than if they are served by exhausted staff. In these cases the cost will rise (as more people have to be employed) but the quality will rise faster. So if we are concerned about inequalities – as apparently the Davos elite are – then reduced working time across all classes is part of the solution. But there is another, equally important, reason for giving this prominence. My friend Ian Gough, who is writing a book on climate change with the great title of Heat, Greed and Need, has drawn my attention to some interesting Swedish research, by Jorgen Larsson and colleagues in Gothenburg. They have constructed various scenarios in relation to carbon consumption, looking at issues such as air and road travel, meat consumption and domestic heating. A supplementary analysis shows that shorter working hours (- 18% of working hours), roughly equivalent to a reduction to a four-day week, could reduce emissions by another 10% or so. It’s not the solution to global warming, but it’s part of the range of measures we need to adopt. Juliet Schor has shown that although people may not choose to take a reduction in working time in preference to higher income, once they actually are working fewer hours they often prefer to stick with these rather than move back up to working longer for more money. I’m not over claiming for the PP, but it’s certainly interesting how it takes us into some important areas.